Easter is a wonderful time of year for delicious produce – the spring season brings with it a whole host of fresh fruit and veg, as well as indulgent sweet treats! Here at Creamline we’ve gathered together the cream of the crop from our local suppliers to bring you an Easter range to hop on to. No Easter season is complete without chocolate! Local artisan chocolatiers Cocoa Cabana have created a range of Easter treats as part of our Best of Local range, including handcrafted eggs filled with truffles, as well as chocolate lollies for little ones. Head to our Daily Essentials range for household favourites! Hot cross buns and chocolate nests? No cupboard should be without these at this time of year! 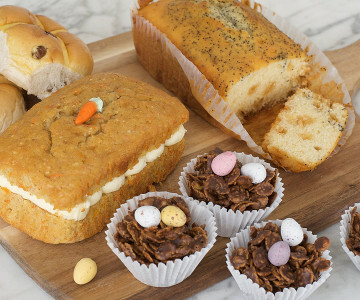 Our local baker Thatchers have hand-baked a range of mouthwatering goodies for our Easter range, not forgetting their indulgent Carrot Loaf Cake and Lemon & Poppy Seed Loaf. As usual, Little Pigs have outdone themselves with their special meat packages this season. Their Whole and Half Leg Lamb specials come complete with hand-prepared pigs in blankets and a jar of Mrs Darlington’s tangy mint sauce, perfect for a family gathering. But it doesn’t stop there – Little Pigs are supplying Turkey, Pork, Beef and Gammon packages too, all locally-sourced and expertly prepared by hand. Fresh seafood is a real treat at this time of year. Our local fishmonger has exclusively sourced The Salmon Special, 800g of premium salmon complete with a creamy dill sauce. Not forgetting cooked Atlantic Prawns, Bream and Sea Trout fillets. Fish lovers are well and truly catered for this season! Perfect for rounding off, don’t forget Cheshire Cheese Co’s selection of artisan cheeses. From the classic Cheshire and Mature Cheddar to Irish Whiskey and Stem Ginger, there’s one for every taste! Head here to browse our full Easter range, and remember to order by 5pm on Thursday 18th April to receive in time for Easter weekend!